The Beauty Foodie Club is the only club helping members fund fulfilling travel to enjoy and experience Paris' best chocolate, culinary, and wine festivals. SANTA MONICA, CA, UNITED STATES, October 26, 2018 /EINPresswire.com/ -- Santa Monica based staffing agency, Recruiting for Good, is sponsoring The Beauty Foodie Club, a social club for women who live in Los Angeles. 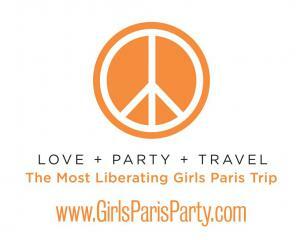 Club members who choose 'Girls Paris Party' reward; enjoy a 7-day trip for two (flights, hotel, and 2 event tickets) to enjoy the city, and festival event. According to The Beauty Foodie Club, Founder Carlos Cymerman, "This past summer, I went to Paris to celebrate my 50th B-Day and watch the World Cup Final with the locals; it inspired me to create Girls Paris Party. 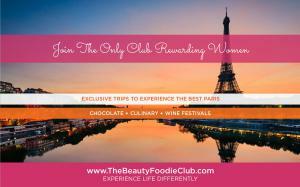 I look forward to rewarding women our Beauty Foodie Paris trips." The Club is rewarding Paris Trips to the following festivals; Salon Du Chocolat (October 31 to November 4, 2019), Le Grand Tasting (November 30 to December 2, 2019), and Omnivore (March 2020). Attend our next Beauty Foodie Party in Santa Monica, some parties require RSVP. Come meet club founder, Carlos Cymerman, have fun, meet like minded-friends, and enjoy fine dining rewards. Carlos Cymerman adds, "We celebrate women who kickass and reward them Beauty Foodie Paris Party Trips...because you are never too old to do it all."